Every day smokers are straying away from their favorite retail smoking brands. The cost is the biggest tipping point. You can save roughly 75% of your money here at Smokers Discounts over the high prices of premium retail brands. It’s overall more beneficial to your wallet . . . and health. The pipe tobacco you can obtain has fewer to no chemical additives, this means purchasing your own tobacco is a healthier alternative to buying traditional brands from the local convenient store down the street. Additionally, the actual taste of the pipe tobacco and herbs used is fresher and defined. This gives each smoke a longer life to every draw allowing the flavor to be stronger as it burns more slowly. 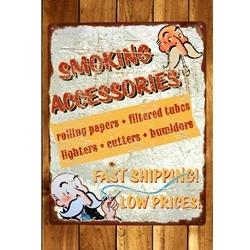 Here at Smokers Discounts, we offer a great selection of smoker supplies and products online such as, tubes, injectors, papers, blunt wraps and other accessories for anyone that wants to save money. If you want it, we have it, or can get it. Try our online tobacco store today!